Does not include the DMW-ZL1 Zoom Lever pictured. Camera/Lens Package: This camera and lens package may come in two boxes - a camera body and the 14-140mm lens. Includes H-VS014140 Lens. Hybrid Touch-Control Digital Camera DMC-GH2 -- Featuring Full HD 1920x1080/60i/24p Movie Recording and the Worlds Fastest Level of Light Speed AF. The LUMIX DMC-GH2 is the latest member of the New Generation System Camera LUMIX G DSL Micro System. Fully compliant with the Micro Four Thirds System lens standard, the LUMIX G DSL Micro System combines a downsized body with advanced functions that achieve both high performance and operational comfort. Featuring an intuitive touch control, the new DMC-GH2 boasts its worlds fastest level Light Speed AF of approx. 0.1 second to capture the subject in spur-of-the-moment in sharp focus. The key components including the sensor and the image processing engine are totally refined to achieve the highest performance of the camera to render a stunning image with high resolution, beautiful gradation and high sensitivity - all worthy of the flagship camera of LUMIX G DSL Micro System, DMC-GH2. There are always two options to record spur-of-the-moment scenes high-quality photos or movies. The user can simply choose the one that saves precious memories most beautifully with DMC-GH2.The predecessor DMC-GH1, which was substantially the first full HD movie recording interchangeable lens system camera with practical auto focus system. The AVCHD format features almost twice the recording time in HD quality than the conventional Motion JPEG format. A special, dedicated button on the top lets the user instantly start recording movies while shooting photos without ever having to make any extra settings changes. Now the DMC-GH2 can record high-resolution full-HD 1920 x 1080 movies in astonishing smooth 60i, doubling the sensor output from 24p to /60p. The DMC-GH2 also supports 1080/24p native mode with 24 Mbps, the highest in AVCHD format bringing an impressive cinema-like afterimage effect to the movie. The newly added Cinema mode option (selectable in the Film mode) gives a movie rich, cinema-like gradation. Now image recording is more flexible and fun with the DMC-GH2. It is now possible to choose a suitable frame rate for movies among 80%, 160%, 200% and 300% with the new Variable Speed Movie mode. The Touch AF in movie recording also lets users enjoy professional-like pull focusing. Just by pointing at the subject, the focus is shifted to the near subject letting it stand out. To elevate its operability even higher, the DMC-G2 adopted touch-control shooting for the first time in the world with an interchangeable lens system camera*. By adding this point-to-shoot ease of use advantage in the DMC-GH2, the perception of complexity when operating a digital interchangeable lens system camera drastically changed. The focus is immediately set to the subject by just touching the large, 460,000-dot LCD, and you can even trigger the shutter by touch. Once you lock on the subject by a touch, the camera tracks the subject with the AF tracking function even if it moves. Just a touch on the screen lets you select the part and the size of AF area with the 1-area AF. The large, high resolution LCD with wide-viewing angle rotates 180 to the side and tilts 270 up and down offers approx. 100% of field of view. Both LCD and LED backlight are newly designed to realize vivid, impressive color reproduction by 25%**. The primary colors-red, blue and green- are reproduced true to the original natural colors. There are some limitations to other functions depending on the lens to attach. With the worlds first* introduction of digital interchangeable lens for 3D still photography with an interchangeable lens system camera, Panasonic proposes to enjoy high-quality shooting in 3D with DMC-GH2. This new compact optional 3D-capable interchangeable lens allows easier handling and instant 3D shooting. It produces 3D images without distortion or time lag between left and right images, even for moving objects. The 3D images, even close-up shots, taken with this lens are easy on the eyes when viewed on 3D VIERA televisions (mpo side by side format). Panasonic made a breakthrough by adding this special way of unprecedented expression in photography with outstanding ease with this innovative technology. The DMC-GH2 provides an array of features that let users capture precisely true-to-life images and create their own beautifully expressive images. The DMC-GH2 features the My Color mode with a total of 7 preset effects Expressive, Retro, Pure, Elegant, Monochrome, Dynamic Art, and Silhouette while inheriting the previous Custom mode, which lets users manually set the color, brightness and saturation levels. With the Full-time Live View function, users can see how these settings will affect the images before they shoot, which makes it easier to capture the exact mood or atmosphere desired. For even more elaborate effects, users can choose from a total of 10 Film modes including the new Cinema mode, and set the contrast, sharpness and saturation levels for each. A custom function lets users store their favorite settings in memory. The DMC-GH2 also provides a total of 22, and most of these modes can be used when shooting motion images too, letting users create movies with dramatic, theatrical effects without having to edit after they shoot. 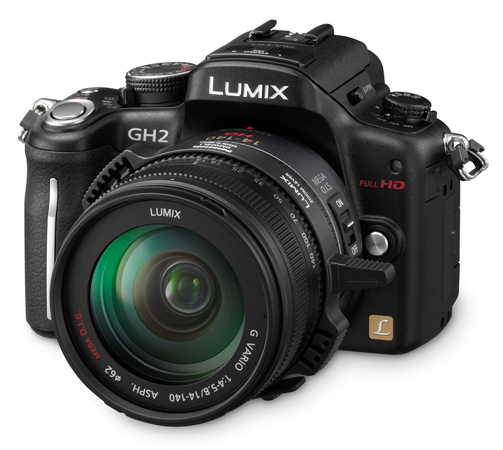 The DMC-GH2 has advanced functions that will satisfy experienced photographers, yet is easy enough for beginners to use comfortably. It's ideal for compact camera owners who want to step up to higher-quality photos but without having to worry about complex photographic techniques. 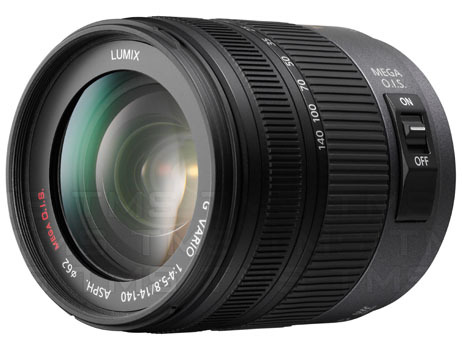 Panasonic achieved this superb ease of use by continuing to improve iA mode with its shooting assist functions that have proven extremely popular in LUMIX compact cameras and adding it to the advanced imaging technologies of the LUMIX G Micro System. The iA mode is available not only in photo but also movie recording. With AF Tracking, the DMC-GH2 can lock onto any subject and keep it in focus even if it moves making it easy to get beautiful, clear shots when a great photo opportunity suddenly arises. Simply aim, lock, and shoot. The Face Recognition function remembers registered faces to give an appropriate AF/AE on the people. In playback, you can choose to display only photos that contain a specific registered face using Category Playback. In addition to the advanced functions mentioned above, the iA mode inherits fundamental functions users need in a good digital still camera. These include MEGA O.I.S., which helps prevent blurring from hand-shake, and Intelligent ISO Control, which reduces motion blur by adjusting the ISO sensitivity if the subject moves as the shot is taken. Intelligent Scene Selector automatically detects the most common shooting situations Portrait, Night Portrait, Scenery, Night Scenery, Close-up and Sunset and switches to the appropriate Scene mode.